LOS ANGELES, Calif. /California Newswire/ — Artistic visionary and electronic music pioneer Moby will perform at Friends of the Los Angeles River’s thirty-year anniversary celebration and fundraiser the “FoLAR Fandango: Take Me to the River,” on October 8, 2016. The event takes place at L.A. River Studios in Cypress Park from 7:30 – 11:30 PM. Moby will perform a seven-song set of fan favorites including “Natural Blues” with the Jason McGee Gospel Choir joining him onstage. Moby is set to release a new record with The Void Pacific Choir on October 14, 2016 entitled “These Systems are Failing”. A video for the song has been released. Music industry tastemaker and renowned entertainment personality Nic Harcourt from KCSN 88.5 FM will host the evening’s program, which includes musical performances by singer-songwriter Mia Doi Todd, The Jason McGee Gospel Choir, DJ set by Kita Klane, Soul band Zach Alwin & Duck Funk. Also just announced: Electro-Soul Duo KANEHOLLER will perform a set at Fandango. “We are so thankful to have Moby perform at our celebration as his vision for the future of the Los Angeles River aligns so well with FoLAR’s mission for coming generations. This melding of art, music and activism is beautiful and a harbinger for what we hope the next thirty years will bring,” said FoLAR President and Founder Lewis MacAdams. The musical performances will be complemented by the exhibitions of four renowned Los Angeles River artists. Christian Kasperkovitz (ELKPEN) will create a chalk art installation and Ryan Patrick Griffin will show a projection piece inspired by the L.A. River. The gallery at L.A. River Studios will serve as a showplace for the work of Peter Bennett and Grove Pashley, two photographers who have a long-standing relationships with FoLAR. This year’s Fandango will feature FoLAR’s unveiling of the Lewis P. MacAdams River Champion Award, a tribute to thirty members of the community and entities that have supported the organization for the past thirty years of LA River advocacy and revitalization. The honorees have been chosen to represent the passionate and diverse community that has made river restoration a major priority for the communities on the Los Angeles River. In the spirit of honoring local makers, movers and shakers, Fandango features various brands and services that have donated their time and goods to the event, including Starry Kitchen, Heirloom LA, Village Pizzeria, Jeni’s Splendid Ice Cream, Maltose Falcons, Deep Eddy Vodka, Angel City Brewery and a special stage light installation by lighting designers Light Riders. 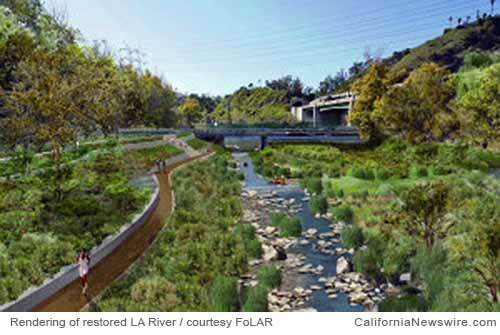 FoLAR is a 501(c) 3 non-profit organization founded in 1986, whose mission is to protect and restore the natural and historic heritage of the Los Angeles River and its riparian habitat through inclusive planning, education and wise stewardship. Effective advocacy, education, collaboration and imagination can accomplish great things. FoLAR knows first-hand that urban restoration requires creativity, technical knowledge and tenacity. FoLAR’s goals, while vast and visionary, are also undeniably attainable. For more information, visit www.FoLAR.org.